After taking control of the Walt Disney company in 1984, Michael Eisner and Frank Wells had a simple goal for the company’s animation division: It had to be at the top of every possible medium. While the benefits of that strategy in the company’s film division paid off with movies including The Little Mermaid and Beauty And The Beast, the story of what happened in the company’s television animation division hasn’t gotten as much focus. Partly, that’s because the strategy Disney pursued ended up being something of a dead end, though it made the corporation a lot of money. Partly, that’s because the style of hand-drawn animation Disney specialized in has become less central to the medium in the last decade. But mostly, the loss of this legacy seems to stem from the company itself, which has moved past that point in its life cycle. For a company as intent on preserving its back catalog as Disney is, it’s surprising how the corporation sometimes seems to have next to no interest in actually exploiting it. That brief foray into television animation was an exception, even though it’s now fallen victim to the rule. This is too bad. DuckTales, the most successful show of Disney’s short-lived television-animation renaissance—and a show that kicked off a brief interest in syndicated afternoon animation from a host of media companies—has mostly disappeared from the limelight, to the degree that the company released around three-quarters of its episodes on DVD, then simply stopped. What’s fascinating about this is that DuckTales is a vastly entertaining show, with quality traits that go beyond its catchy theme song, and it’s incredibly easy to gobble up episode after episode of the thing. Plenty of cartoons from the ’80s and ’90s fail the nostalgia test, simply falling apart when re-examined through the lens of adulthood. DuckTales isn’t one, and returning to it as an adult reveals that there are hidden pleasures there that go beyond memories of what it was like to watch as a kid. For a show so breathless and action-packed, DuckTales takes its time, and that makes all the difference. When Disney began its foray into TV animation, it started with Wuzzles and Adventures Of The Gummi Bears. Both programs had higher-quality animation than TV was known for, but both were also Saturday-morning cartoons. While there was money to be made in those, the profit margin was lower than in the world of weekday syndication, a largely untapped market that was mostly dominated by reruns of kid-friendly sitcoms and old Hanna Barbara productions. The reason there was more money in afternoon syndication was simple: On Saturday mornings, Disney was subject to the whims of one of the “big three” networks, which could cancel a program short of the kids’ syndication barrier of 65 episodes (allowing for 13 straight weeks of one episode per weekday, thus allowing the series to be run four times per year). This happened with Wuzzles, which was canceled with only 13 episodes produced. Although Gummi Bears eventually reached the syndication number, it only crawled there over several years. Producing its own syndicated content let Disney take control of its own output. The company was weaker in the ’80s than it is now, but it still had a massive global reach, which it could use to place the show in markets all over the world. By going the syndication route, Disney would make money hand over fist with a hit, because it would be dealing directly with local television stations, which would buy the program—and pay a premium for one that scored in the ratings. The risk, however, was that without a bench of animated product to sell (outside of packaging its own theatrical shorts), the company would have to make a massive cash outlay at the start of the series to get the 65 episodes necessary to make the package attractive to local stations. This would require making an investment of tens of millions of dollars, no small amount in the ’80s. If the show proved a flop, Disney likely would make only a pittance of that back. It’s an understatement to say DuckTales was a hit. Not only did it lead to a huge number of additional Disney animated shows that entered the “Disney afternoon” syndication package—shows like Chip ’N’ Dale Rescue Rangers, TaleSpin, and Darkwing Duck—but it led to other studios raiding their own cabinets to see what could be reworked into programs that would entertain America’s bored latchkey kids. With the rise of two-income households, there were more and more kids out there who couldn’t be bothered to do their homework until someone made them, and an army of shows marched onto TV to entertain them, including legitimate classics like Animaniacs and Batman: The Animated Series. DuckTales was the first, however, and it served almost as a statement of purpose. Rather than trying to be as kid-friendly as possible, the series made its protagonist an irascible old man. Rather than celebrating the sorts of family-friendly virtues Disney was associated with, the series was about the awesomeness of unchecked avarice and greed. (Fittingly, it debuted the same year as Oliver Stone’s Wall Street, with its famous “Greed is good” speech.) And instead of drawing its inspiration from a toy line or popular movie (like other pioneers in the afternoon animated-syndication market), DuckTales drew its inspiration from a series of comic books that weren’t terribly well-known in the United States. Rather than creating a show designed to sell toys or act as a lengthy commercial for some other property, DuckTales was meant to tell entertaining stories that would establish Disney as a place for a more sophisticated kind of children’s storytelling. It’s important not to overstate this; compared to something like Batman, DuckTales isn’t the most mature animated series in TV history. But in 1987, it must have felt like an oasis. Like the comics that inspired it—by Carl Barks, a man known for years as “the good duck artist”—the show has a unique ability to tell adventure tales that will appeal to kids, but nonetheless have interest for adults as well. According to Tad Stones, a longtime Disney employee who worked as a story editor on DuckTales, the connection to Barks was mostly a loose one. But what’s most impressive about DuckTales is just how adventurous the storytelling is. The genre switches from episode to episode. The plots are often complex and multi-layered, and the show will take a good five minutes to set up all the backstory at the top of an episode, before letting the action sequences rip. In certain episodes, there’s a deeper exploration of the characters’ motivations and morality than might be expected on a series aimed at kids. The series also has a surprisingly sophisticated sense of cultural references, dipping into various cultural wells from time to time, most notably in an episode that strands Scrooge and the other characters on an island straight out of The Tempest and populated with various Shakespearean types. This isn’t an educational show, by any means, but there’s so much imagination in it that it’s not hard to imagine kids who watched it having their minds expanded anyway. Ultimately, the afternoon-syndication space collapsed, Disney turned its focus elsewhere, and the world that provided for shows like DuckTales disappeared or moved to cable, where the aggressive targeting of kids would leave less room for the odder elements of the DuckTales stew. Disney underwent an executive switchover in the mid-’90s, and the new suits were less interested in the duck programming, with the company’s television-animation division switching more and more to creating TV extensions of popular theatrical hits, like Aladdin. 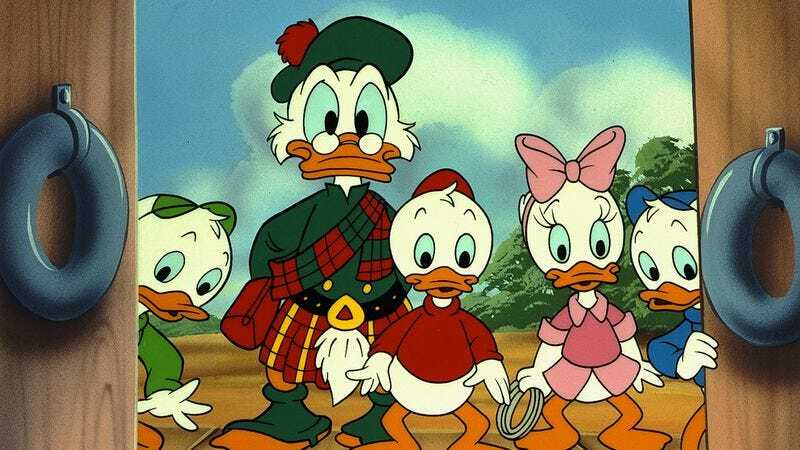 It also didn’t help that the animation syndicated market collapsed with the rise of cable competitors like Nickelodeon and Disney Channel, competitors that began producing their own animated content aimed at the DuckTales fan base in the early ’90s. The factors squeezed out the market for this sort of more sophisticated animated product almost as quickly as it was established. DuckTales went on the air in 1987. When it produced its last new episode in 1990, the syndication market was already being squeezed out of existence. DuckTales reached 100 episodes with three additional, shorter seasons, and garnered a theatrical film adaptation. There was a pseudo-spinoff in Darkwing Duck, and the show’s legacy loomed large for about five years. But just as quickly, the space Disney had seen as a business opportunity and exploited in surprisingly artistic fashion dried up. TV was increasingly becoming a series of niches, and it was hard to shove something like DuckTales—or Tiny Toon Adventures, or Batman—into one of those niches. DuckTales doesn’t qualify as a lost classic or anything—too many people remember it for that—but it’s surprising to look back at it today and realize just how thoroughly it was shaped by the world that required it, a space on the TV schedule that simply doesn’t exist anymore.